The Source Nail Vaporizer - Premium Kit is a portable and power dab rig. The Soruce Nail has a compact design which provides temperature control while providing the power of a traditional desktop rig. The kit features high-grade atomizers made famous by the outstanding technology developed from Source Vapes. The atomizers have an easy-to-clean bucket style and are crafted with lab-tested titanium, ceramic and quartz. The Source Nail XL Premium Kit is compatible with three premium glass attachments, one comes included with kit. 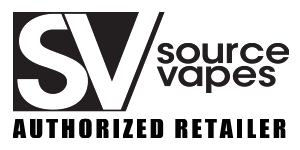 Source Vapes provides a lifetime no issues warranty on the device. The kit is perfect for concentrate enthusiasts who want dab rips from a compact, portable, and convenient device. PORTABLE ENAIL The Source Nail XL Premium Kit provides three temperature settings in a slim battery which is both powerful and simple to use. Enjoy sessions in less than 30 seconds. Select from low, medium, or high to dial in the perfect dab session. The Source Nail XL rig is quite easy to operate. Simply press the activator button two times and the light will change to green indicating you are ready to vaporize. The Source Nail XL rig charges up quick and provides an extended battery lifespan. Enjoy large, lung expanding pulls which robust are rich with flavor. HIGH GRADE WAX ATOMIZERS Source Vapes are best known for producing high grade atomizers. The Source Nail XL Premium Kit, includes their industry leading coil-less bucket nail atomizers which vaporize waxy oil concentrates efficiently leaving little or nothing to clean up. Source Nail XL Premium dab rig includes three nail atomizers which are made from Titanium, Ceramic, and Quartz. Each atomizer produces different types of vapor. The quartz atomizer produces pure untainted flavor. For larger vapor cloud which still have rich quality vapor, the ceramic atomizer is dialed in to vaporize concentrates and a low and slow process resulting in smooth, hugely rich vapor clouds. The Source Nail XL dab rig works with any of the XL or 4 Series atomizers crafted by Source Vapes. GLASS ATTACHMENTS The Source Nail XL Premium dab rig is compatible with all 510-thread glass attachments. The kit includes a split glass bubbler and a glass globe attachment. The Source bubbler purifies and conditions the vapor with water purification. You can use the Source Nail XL as traditional VapePen by securing the glass globe attachment. Source Vapes offers a wide variety of high grade glass attachments which are compatible with the new Source Nail XL Premium dab rig. Source glass attachments lasts longer then standard attachments because they are made of more durable material, helping to preserve the true flavor of your concentrates. TEMPERATURE CONTROL The Source Nail XL Premium dab rig features three temp settings allowing you to choose between small flavor-intense hits, medium hits, and lung-expanding large clouds. The single button activator makes operation simple and efficient. With a few clicks of a button you can enjoy your favorite waxy oil concentrates exactly how you prefer. The Source Nail XL Premium kit has a super slim battery which is easy to fit in your pocket and is more compact than other e-nails. The kit is designed for home use and quick dab hits while on the go. 25% OFF WITH CODE "SOURCENAIL"